Though I know it is not customary, please allow me to begin with an apology, because I know that often times what we look for when asking for the best things to do in a city, we are not looking for the list of touristy landmarks. However, in Prague, it seems that for at least some of the city, the touristy places are the best places to be. That being said, let us journey through Prague! The year is 1357, and King Charles IV commissions a structure of 520 meters of cobblestone, 16 arches, and 30 baroque statues of religious figures. Okay, perhaps he was not quite so specific on the details, but the glorious Charles bridge is the result. Visiting the Charles bridge is generally a “must-do” in Prague, offering the most stunning views of the city over the Vltava river. Similarly, for those of eclectic architectural taste, the city offers stunning view of the Prague Castle. What’s more breathtaking however is actually visiting the castle. Due to numerous renovations and restorations that have been completed post Velvet Revolution, the castle provides visitors with castles ranging in style from Roman through Gothic. Again, despite the fact that this is quite a touristy thing to do, you will otherwise see the castle every day, staring you down, knowing that you have not yet visited. And if that is not enough to convince you, let me mention that the castle is a UNESCO World Heritage Site, therefore making it another “must-see” in Prague. Sticking to the theme of eclectic styles of architecture, one may also choose to visit Prague’s renowned Old Town Square. The area remains virtually untouched since the 10th century, and though it currently hosts hundreds of tourists, vendors, dance troupes, and performers (among others), is still rich with history. Amid the notable buildings in Old Town Square is the Prague Orloj, otherwise known as the Astronomical Clock. Installed in 1410, the Orloj is the third oldest astronomical clock, and the oldest one that is still working. The clock itself consists of three main components; the astronomical dials, the sun and moon displaying astronomical details, and the “Walk of the Apostles” that shows figures of moving sculptures on the hour. 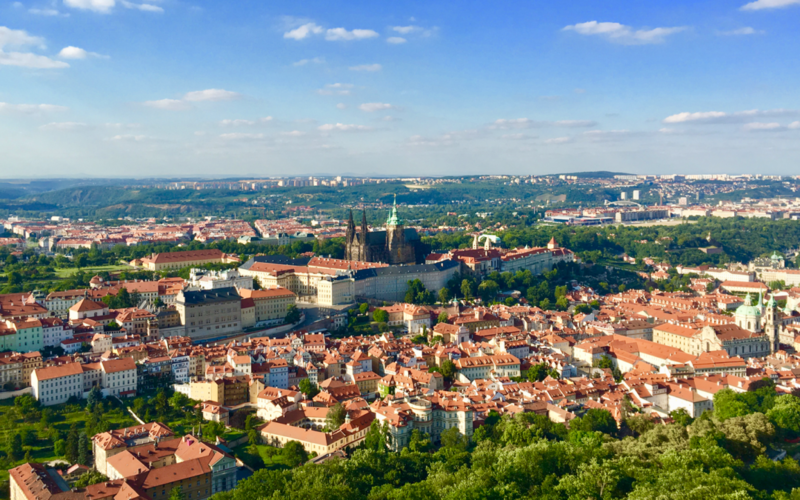 Once you have exhausted your day viewing these wonderful locations, it’s time to enjoy Prague for what it is best known for. Sorry mom and dad, but that means BEER! Really, any bar will do because the drinks are purely fantastic everywhere you go, and beer truly does cost less than water. If you’re looking for something a little more notable in the realm of night life, try Bunkr Parukarka. This nightclub is hidden behind a graffitied door, and is housed in the remnants of a 1950s nuclear bunker. Now that you obviously feel informed, go forth and enjoy Prague! Příjemnou zábavu!